There will be a choice of two walks, and we need to know by the previous evening who is going on which so that we can sort out transport. We will leave Sidholme immediately after breakfast, preferably by 0930. We drive about 8 miles to the beach near Branscombe. Google says it will take 18 minutes. We park in the pay and display car park at the beach. We will start walking when everyone has arrived. The walk is a fairly easy 2½ miles with one significant hill. Click for a map of the walk. 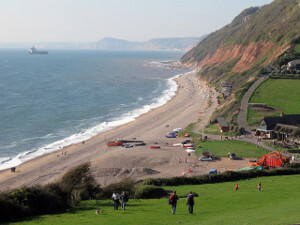 There is a café at Branscombe Beach, and you should be able to find one wherever you decide to spend the afternoon. We will leave Sidholme immediately after breakfast, preferably by 0900. We drive about 23 miles to a National Trust car park on the Golden Cap estate. Google says it will take about 40 minutes. If your car has a 2015 National Trust sticker, parking is free, but for others there is a fee. We will start walking when everyone has arrived. The walk is about 5.3 miles, and is hillier than we are used to on our Saturday walks. It will definitely be too demanding for some of our party, but for those who can manage it the scenery is, in my opinion, the best we will see anywhere in the weekend. Click for a map of the walk. 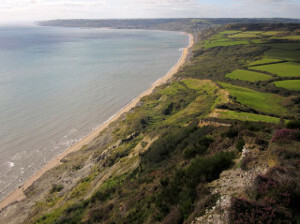 The nearest village to Golden Cap is Charmouth, where Barbara and I can recommend a café. There are plenty of possibilities in Lyme Regis. We have made no specific plans for Sunday afternoon. You can find ideas by clicking the Afternoons button. Dinner will be at 1900, followed by a beetle drive organised by the hotel.